Loos (Loos-en-Gohelle) is a village in the Pas de Calais to the north of the road from Lens to Bethune. The village has given its name to the battle of the 25th September - 8th October 1915, in which it was captured from the Germans by the 15th (Scottish) and 47th (London) Divisions, and defended by French troops on the 8th October. BARTS ALLEY CEMETERY, VERMELLES, about 1 kilometre North-East of the village, named from a communication trench in which a Dressing Station was established. It contained the graves of 38 soldiers from the United Kingdom, who fell, for the most part, in the Battle of Loos. CALDRON MILITARY CEMETERY (RED MILL), in the Southern part of the town of LIEVIN, in which were buried 85 soldiers from the United Kingdom (mainly of the 46th (North Midland) Division), 38 from Canada and one German. CITE CALONNE MILITARY CEMETERY, LIEVIN, in the middle of a mining village between Grenay and Lievin. The cemetery was begun by French troops and used by the British from March, 1916, onwards. 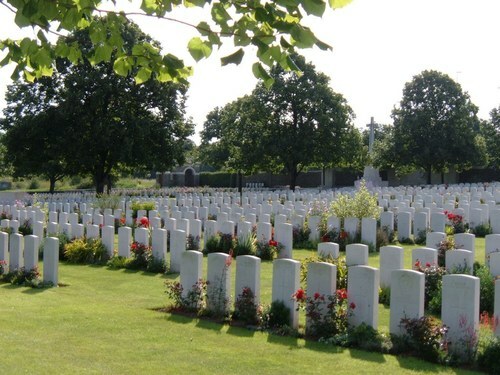 It contained the graves of 207 soldiers from the United Kingdom, five from Canada, 130 French and six German. CORKSCREW CEMETERY, LOOS, which was close to the mine known as Fosse II. It contained the graves of 168 soldiers from the United Kingdom and 38 from Canada. COURCELLES-LES-LENS COMMUNAL CEMETERY, in which 19 soldiers and one airman from the United Kingdom, mainly of the 12th (Eastern) Division, were buried in October, 1918. LIEVIN STATION CEMETERY, on the North-West side of the railway station, used in 1917 and containing the graves of 48 soldiers from the United Kingdom (almost all of the 46th (North Midland) Division) and 12 from Canada. LOOS (FORT GLATZ) GERMAN CEMETERY, named from a German strong point at the North-West corner of the village, and containing the graves of three soldiers from the United Kingdom who fell in the summer of 1915. The great majority of the soldiers buried here fell in the Battle of Loos. There are nearly 3,000, 1914-18 casualties commemorated in this site. Of these, two-thirds from the 1914-18 are unidentified and special memorials are erected to two soldiers from the United Kingdom and four from Canada who are known or believed to be buried among them. Other special memorials record the names of 44 soldiers from Canada and 12 from the United Kingdom, buried in other cemeteries, whose graves were destroyed by shell fire.